Buddhism is a religion and philosophy encompassing a variety of traditions, beliefs and practices, largely based on teachings attributed to Siddhartha Gautama, commonly known as the Buddha. 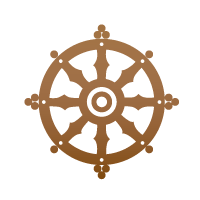 The wheel of Dharma is one of the most important religious Buddhist symbols. The symbolises the Buddha's turning the Wheel of Truth or Law. The wheel refers to the story that shortly after the Buddha achieved enlightenment, Brahma came down from heaven and requested the Buddha to teach by offering him a Dharmachakra. The eight spokes of the wheel symbolize the Noble Eightfold Path set out by the Buddha in his teachings. The wheel also represents the endless cycle of samsara, or rebirth, which can only be escaped by means of the Buddha's teachings. And some Buddhists regard the the wheel's three basic parts as symbols of the "three trainings" in Buddhist practice: The hub symbolizes moral discipline, which stabilizes the mind. The spokes (usually there are eight) represent wisdom which is applied to defeat ignorance. The rim represents training in concentration, which holds everything else together.